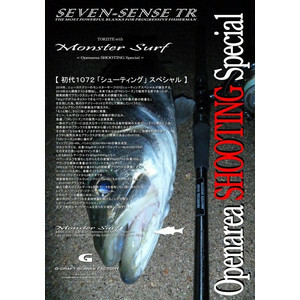 First 1072 Shooting" Special Ocean Surf Only Design 2016， the new category monster surf 1072 shooting special is born. Although it was supposed to start the development test from 2010 and originally it should have sold in the "PE series"， at the development stage it was the biggest problem of the blank concept， "45 g jig can possess full power casting power As we aimed at "maximizing weight saving"， as we develop in parallel with other category rods， new blank manufacturing methods are steadily established， "more light and stronger" developed excessively， Release information of the Torzite Ring jumps in and it is planned to sell it to "TR Series" in a hurry. Some of the anglers were secretly exhibited at the annual convention held in a vast surf， so I think that some people held blanks under development for several years. Every time it receives "Better yet?" "You expect it to come out next year?" It received a bitter indication many times， and it finally completed the blank which can be sold. This 1072 is leaked to the example of "TR series" 30 t + 40 t for tip and 30 t + 40 t + 46 t for bat composite molding. For clarity， Monster Jetty MJS 1002 TR， which is 163 g of its own weight， is 7 inches long with its usual comfort and yet the MAX lure weight is 45 g of 5 g UP， while strengthening the power and torque， the difference is only 5 g proto weight 168 g， blanks simplex While the weight is 10.7 feet， the difference is only 0.5 g compared with 1002 with a super lightweight blank mounted. The reel seat is the same， the loading guide is the same， 1072 is despite triple lapping of the strength from the bat guide to the 3rd piece. You can not create it unless you hold huge amount of test data and design data at blanks of this 1072， kiln. Top minor · vib · jig · jig head worm， delicate to any lure， it is possible to keep ping points far off the coast for a long time， this "shooting special" enjoying a vast and exhilarating surf game as much as you want I want to receive it. Aiming at the large Suzuki family mainly for surfing facing the ocean， vibrations (21 g - 28 g) from medium size minnow (120 - 140 mm) (21 g - 28 g)， reversing flow at around 30 g such as reversing flow etc Flying distance around 28 g which is standard Easy to handle lure in general， easy to handle with the tip and resistance to flow resistance， easy to repel tapers can easily rebound and adjust the position to start bending 46 tons， designed a super lightweight power blank with repulsion and tension. For knots please tied to the leader and bind with friction knots that do not make cobs. In addition， the leader length can be used less troubles from 1.5 m (1 Hiro) to 1.0 m (arrow drawing). We recommend casting the leader's binding part outside the top guide. Long leaders can not be recommended ※ The images of products that are on display representative images. Moreover， the color may look different from the real one. Please be forewarned."